I am actually a bit sad that I didn’t take pics of my eats yesterday. They weren’t necessarily all that exciting, but they were the first meals that I have enjoyed in days. Thank you to Jenn for hosting, I am so excited to continue to share my thoughts and eats with you all! I lied! 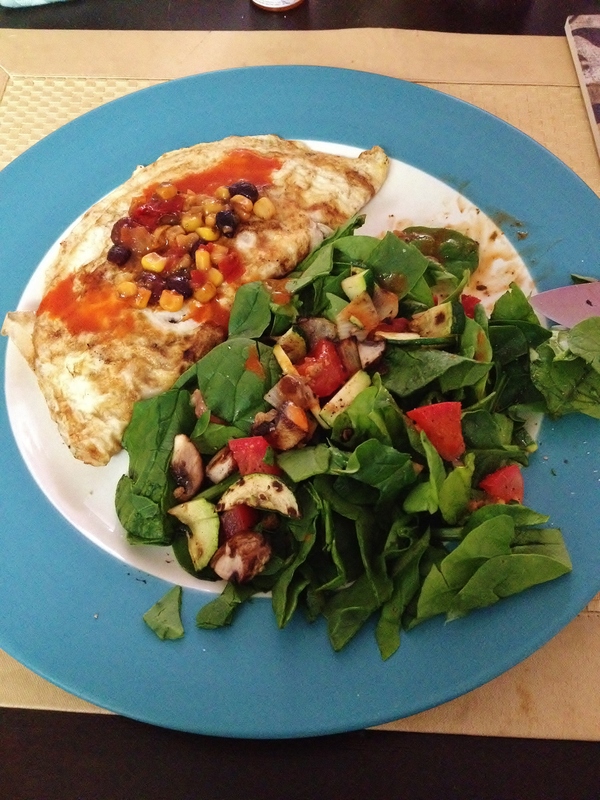 Here is part 1, the omelet. random nibbles during the afternoon (I felt like crud the whole pm, and ended up taking a nap/ish for a while. I had an early dinner of Amy’s Vegetable Barley soup with Amylu’s Chorizo chicken sausage cut up into it, a very small salad (with more Cowboy Caviar) and TJ’s Inner Peas. Finished out the day with Earth Balance Coconut-PB on Cherry Vanilla and Cookies and Cream ice cream with sprinkles and my zucchini pumpkin goji protein muffins. More puffins. And I helped myself to Alex’s dinner. I munched on and off throughout the day because I was home, and that’s how it goes. So, yes, I snacked, but I had whole meals, not just mini meals. What a lovely change up to this weekend. I needed a lighter day of eats after the uncontrollable gorging. Now, on to the star of the show! This is a simple recipe, based on simple principles, simple ingredients, and simple flavors. And you know what? It might be one of my favorites that I’ve made thus far. I made it, froze it, thawed it out for a few hours, portioned it, and refroze a few portions for later. This Sweet Potato Shepherd’s Pie is the gift that will keep on giving. Filled with goodness–protein, carbs, and veggies. Make it with what you have on hand, for a crowd, or for one! As always, suggestions for substitutions and enhancements are at the bottom. 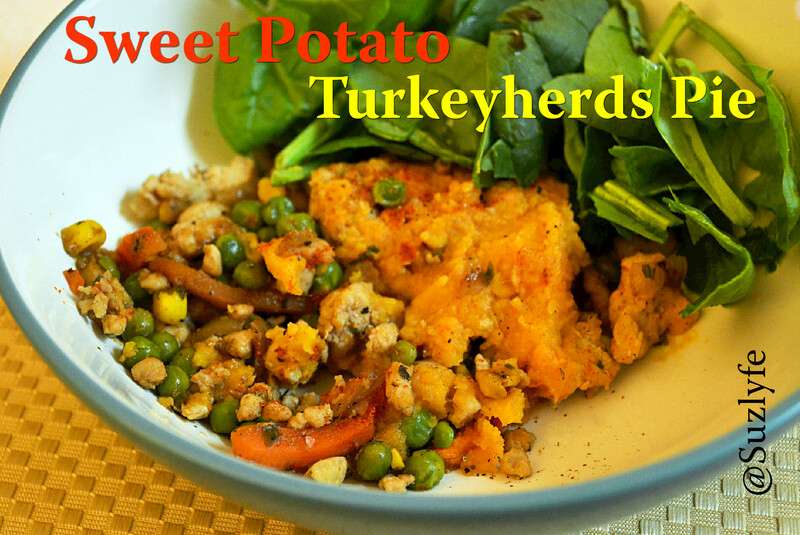 A delicious, healthy take on the traditional Irish favorite, this sweet potato shepherd's pie is just as tasty! Gluten Free. Store bought veggie mix (peas, carrots, mushrooms, onion), maybe some red peppers--whatever you want, but make sure the traditional 4 are in there! Bring a sauce pan of salted water with 2 cloves garlic to boil (I also added some chicken broth to this). Boil/steam the sweet potatoes (peeled and cubed) in boiling water until fork tender, drain and empty into a large enough bowl to mash. Retain garlic clove. Add seasonings, begin to mash, using chicken broth to loosen as you go. You don't want the mixture to be overly thick or loose--it should have body and not ooze. Feel free to add some greek yogurt or milk! In meat pan, saute fresh veggies (if using) first, until soft. Add garlic just before adding frozen veggies, so as not to burn it. Make sure to season! If only using frozen veg, feel free to thaw in microwave first, or to simply heat through in pan, but DO NOT PUT OIL IN IF YOU ARE DOING THIS!! Season and cook until ice is mostly gone (need not be cooked thru). Add browned meat to pan with the veggies still in, mix together and add worchester (to taste), barbeque sauce, mustards, and chicken broth, flour if you are including. Cover and reduce to low for 5 minutes, remove cover for an additional 5ish mins. remove from heat. In an oven safe casserole pan, lasagna pan, or even in muffin tins(! ), layer desired amounts of protein/veg mixture on bottom, and then desired amount of sweet potato mash over top. Sprinkle top with a little garlic powder (if desired) and some paprika. If immediately eating, place in a 400F oven for sufficient time to turn potatoes golden (will differ depending on ratios, but 10-20 mins). Remove and let serve 5 mins before serving! If frozen, can simply be reheated in microwave, or in 350 oven for 15-25 minutes. Acorn, butternut, or another squash would make an excellent addition to the mash layer! Be sure to adjust seasonings as you desire, and based on what protein you are using. Also, you will likely need less Worchestershire sauce if you are going with the BBQ sauce option. Butter, whole milk, any of those things are welcome additions, but honestly, you don't need them! If you are using them, adjust salt content accordingly. Could also make this more sweet-savory by adding maple syrup, cinnamon, and brown sugar to the top layer. Maybe even a little cheese could be put in the mash as well. Fresh veggies are great in this, and give it a lot of body, as well as the more well rounded, pan-cooked and seasoned taste from the browning. But don't feel like you are going to miss out if you rely on frozen--I did! On that subject, feel free to use a pre-seasoned mix of veggies, like the Trader Joe's Garlic Butter frozen veg medley. Again, ADJUST SEASONING!! And, in full disclosure, the first time I made this (and you can tell in the pics! ), I didn’t plan out my ratios and wasn’t happy with the amount of sweet potato. So after I thawed it out, I simply repeated my mash layer process and added on! But make sure that the main components are fairly thawed before you do this, otherwise the layers won’t meld properly. Seriously, this is a new favorite. Make it now, make it this summer. It is a crowd pleaser as well as a great option for single serving days.